The Dura Dry Waterproofing System is a drain system that is installed along the interior of the foundation where the wall and floor meet. Installing a good drainage system, like the Dura Dry Waterproofing System, is only part of the battle when it comes to getting water out of your basement or crawlspace. 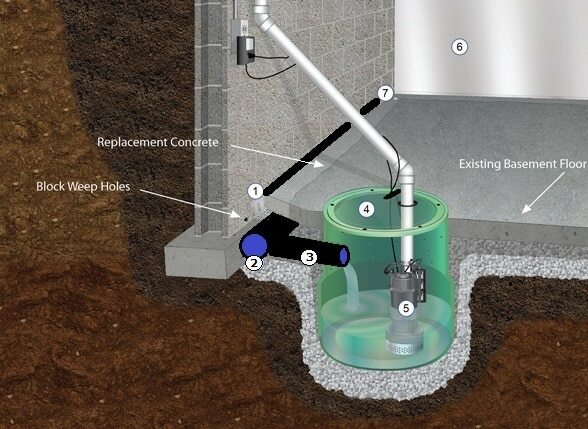 Using a quality sump pump and high efficiency basin are just as important. If your system does what it is designed to do then it is going to collect water, sometimes a lot of water, and you have to get it discharged as quickly and efficiently as possible. By combining our high efficiency Bell Basin with Pro Series commercial grade sump pumps you have the best of both. For stone foundations the wall must be covered with a wall wrap to insure the water from the wall makes it to the Upper Wall Drain. All foundation wall can be covered with our wall wrap and in many situations it creates a much more healthy environment for the whole home and gives the basement a cleaner more finished look. The Dura Dry Waterproofing System is a tried and true system that comes with a lifetime guarantee against future water intrusion. Many companies have there own version of this system and the truth is that when installed properly most of them will work. The key is to find a company that will use quality materials and highly trained crews to do it correctly the first time. At Foundation 1 you will get the best from us every time and you will get the best materials installed by the best crews in the Midwest, all backed by the best warranties in the industry. Click here or click the tab above to visit our Sump Pump page and get more information on the Bell Basin and Pro Series Sump Pumps. "Installed in 2 days at a fair price. Highly recommend them for any looking to solve a leaky basement issue." "Now that I know exactly what the techniques entail, I understand why this is such expensive work!" "Very happy with the job the team did waterproofing my basement and installing a sump pump."